If you're a fan of biblichor, the comforting musty smell that wafts through every used bookstore, and if you love getting lost in stacks and shelves never to find your way out again, searching and searching with no real agenda besides the joy of discovery and surprise, then Amazon Books is probably not the bookstore for you. nBut, if you’re looking for quick and easy reading recommendations based on data, well then, you've found your home. Amazon Books is very in tune with its overall shopping experience. From the calm lighting to the minimalist design, everything is set up to evoke a clean, organized feeling of ease. After visiting the Georgetown store, I thought now was the right time to point out a few principles content marketers can take from the Amazon Books model and apply to their work. By collecting data through search, purchase history and even the keen ear of Alexa (which, depending on who you ask, is always listening), Amazon is able to understand its audiences' habits, needs, and desires. With this research, Amazon has turned their entire store into an assisted discovery experience. Signs make recommendations, pointing you from popular books to similar, but lesser known or newer books you may also love. Since customers already have an established relationship of trust with the brand, they appreciate these recommendations and cherish them as if a friend made them. Amazon Books does a great job of providing value outside of their own recommendations by sharing beloved authors' picks, reviews from customers online, lists certain books may have ranked on, and more. All of this information is relevant to Amazon's customers and it aids them in their decision-making process. Create content that informs, entertains, or educates your audience. You want to help them solve their problems, make a decision, or learn something new. If you're not providing value, why should they bother engaging with your content, or for that matter, your brand? There is one noticeable thing missing from Amazon Books—prices. Instead of traditional price tags, customers need to scan the barcodes on each book with their Amazon app. Everything is based on the online prices, which change fairly often, and Amazon Prime members receive the same digital discounts in person. While at first, I was annoyed that I had to pull out my phone, update my Amazon app, and then scan each book to see the price, I quickly realized it was pretty easy, and it opened the door to even more information and recommendations. Amazon Books entire ethos is based around bringing the benefits of online and offline shopping to life. So you can try their gadgets in-person, flip through the pages of the book you were interested in, but also see more online and check-out from your mobile device. This cohesiveness and integration make customers' lives easier. Make sure your content and marketing all work seamlessly together so your customer has one harmonious experience. 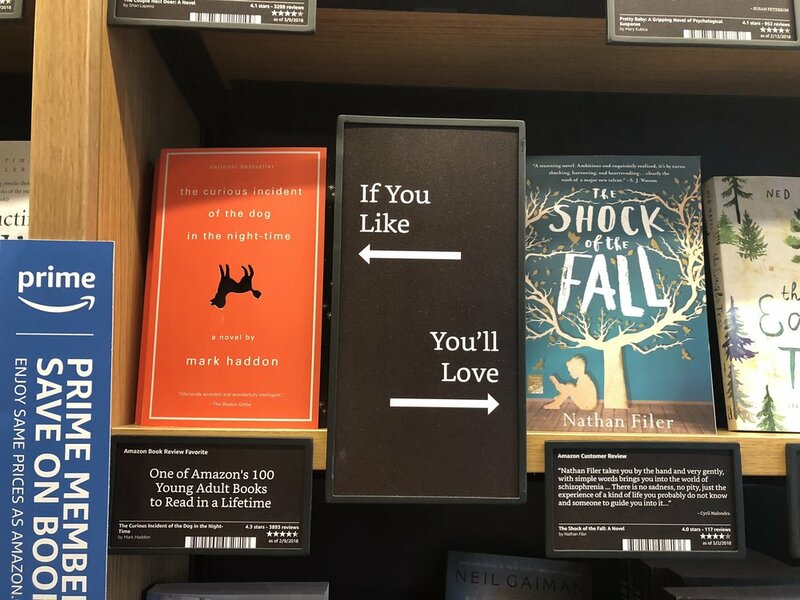 While there are many interesting and positive pointers we can take away from Amazon Books, we can also look to the new brick and mortar stores for a few reminders on what not to do. The biggest one being, never forget or ignore what your customer came to you for. In order to uphold their minimalistic vibe, Amazon Books is very selective about the number of books they stock. It almost felt like there were more electronics, toys, games, home décor, and other gifts, especially towards the entrance, then there were actual books. Ally Schweitzer from WaMu reported back in March that, "The Georgetown shop currently stocks 5,600 titles. Compare that with the 17,500 currently on sale at Politics & Prose in Northwest D.C." Now, with that said, they counteract this by making it easy order anything you can't find in-store, online. When it comes to content, it's okay to stray from your core premise from time to time, but always remember to keep what your customer is looking for at the center of everything you do. And if you're near an Amazon Books check it out, they're pretty neat.